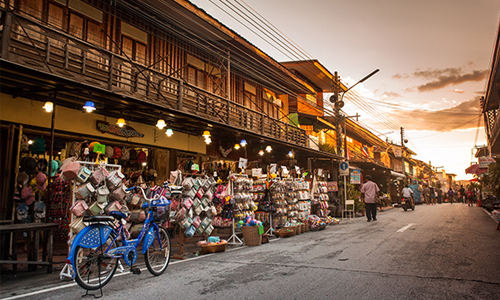 As one of Thailand’s least-populated provinces, Loei has long been off the tourist radar. But this green and lovely land offers so much in the way of natural beauty, diversity and cultural experiences that when travellers do come here, they’re often pleased that Loei has kept its secrets for so long. Visit Loei in Thailand’s cool season and you’ll enjoy cool crisp days of perfect walking weather; the rest of the year it is lush and green. There are spicy fresh foods to try, colourful festivals and some of the best treks the kingdom can offer. Tourists are so rare here, so you’ll enjoy an experience that oozes with the essence of Thainess. Down every winding road, there’s a view, often timeless Thai scenes like farmers planting rice, against a backdrop of hills, children swimming in the rivers, or monks on their morning rounds to receive alms. Loei’s unique tradition, the Phi Ta Khon Festival: If you’ve a few free days and want to experience the less-travelled destinations, here are Loei’s must-see attractions. 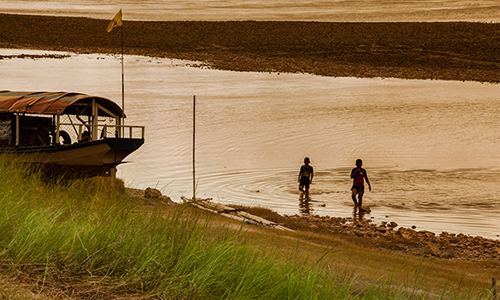 Loei is great if you’re seeking peace and quiet and the Huai Krathing Reservoir offers sublime relaxation. This lovely lake is surrounded by often misty hills and orchards and these are best enjoyed from the water. Hire one of the thatched rafts that float on bundles of bamboo and be towed out to a peaceful stretch of the reservoir. Once there, you put down a large rock as anchor and your boatman leaves you alone to enjoy the tranquil scenery. You can lounge about, enjoy drinks with friends, dig into hot Isan salads or dive into the waters to cool off. Refreshments are brought in by waterborne waiters who are a phone call away. 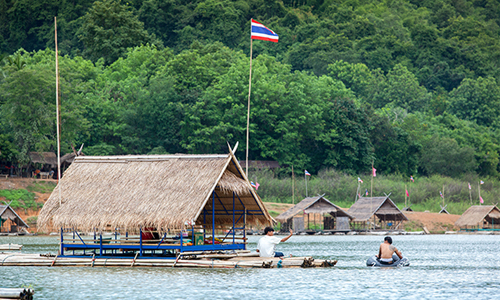 You can bob around on the reservoir for as long as you want; it’s a sublimely bucolic way to spend an afternoon with friends and most visitors regard it as one of Loei’s highlights. Ghostly streets – the Phi Ta Khon Festival of Dan Sai: The popular Phi Ta Khon Festival is the province’s most famous event and brings in increasing numbers of annual visitors who want to see first-hand the more ancient elements of Loei’s life. 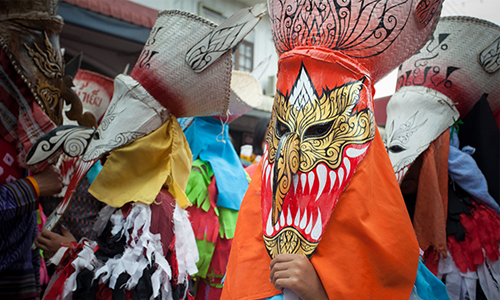 Held in the Dan Sai district of Loei between March and July, Phi Ta Khon is known for the carnival of locals dressed in distinctive and wildly colourful masks and headgear to celebrate the Buddhist festival of Bun Phawet. There are fun parades, fertility rites and a boisterous atmosphere of misrule that makes for a unique experience. 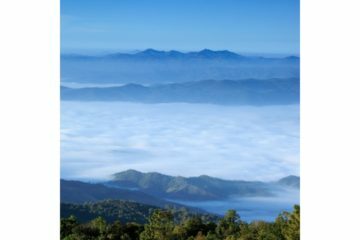 The natural wonders of Phu Ho and Nong Hin: Some years ago, it was noticed that Loei’s 900-metre Phu Ho resembled Japan’s more famous Mount Fuji and people have been coming here to look ever since (Click to read related article: A very Thai time in the lovely hills of Loei). It’s worth making the trip; there are some lovely walks up nearby Phu Pa Po where you can take in the views not only of Phu Ho but across the whole of Loei’s lush landscape. Tractors take you through meadows of wildflowers and every ridge seems to boast a beautiful view. Tai Dam Village in Chiang Khan: Northeastern Thailand is home to many cultural and ethnic groups, each with their own traditions. In the Loei village of Ban Pa Na Nat you can meet some of Southeast Asia’s most fascinating people, the Tai Dam. The now dispersed Tai Dam originated in Dien Bien Phu in Vietnam, and the tight knit community living in Loei crossed over from Lao PDR. to the Chiang Khan district during the Vietnam War. 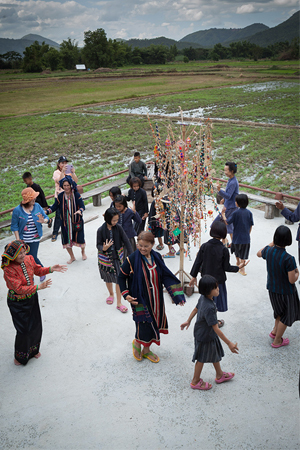 They have preserved their customs and traditions and welcome visitors to their village, built in the Tai Dam style. You can visit Tai Dam houses, learn about how the people work and play, and see examples of the lovely and distinctive cloth they weave. Make sure you visit when the community perform their traditional dances. The movements are accompanied by heavy percussion and are distinct from the Thai style of dancing seen in other parts of the kingdom. 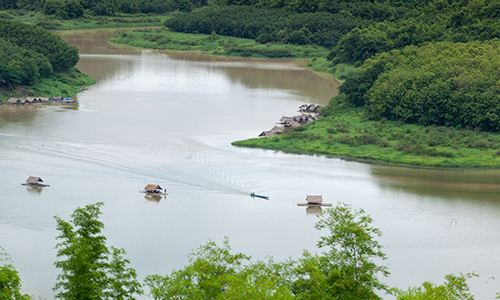 Kaeng Khut Khu – a window into Lao PDR: Kaeng Khut Khu in Loei’s far north is a lovely place to spend an afternoon, walking alongside the mighty Mekong. This tight bend in the river creates sandbanks and rapids from November to May when it’s also possible to see the famous coloured boulders that are submerged at other times. Locals come to enjoy the sunset over the hills of Chana Kham in Lao PDR. and to eat meals of grilled fish and spicy salads on the riverbank. For a longer day trip, hire a boat and enjoy breath-taking views from this magnificent waterway. 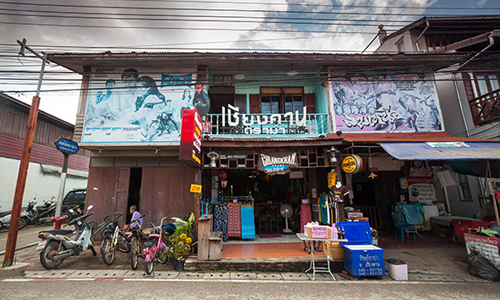 Charming Chiang Khan – a riverside retreat Northeastern Thailand’s best-kept secret, Chiang Khan is a relaxed and lovely town on the Mekong’s Thai bank. Once an important crossing town into colonial Lao PDR., Chiang Khan, retains an old world-feel and the main Chai Khong Road of the town, adjacent to the river, is lined with teakwood hotels built in an Indochinese style. During the day, when the town seems to slumber, you should visit Lao-style temples; such as, Wat Si Khun Mueang, which was built in the reign of Rama III and has some lovely murals. Things liven up on Chai Khong Road in the evenings when a popular night market is held, with the usual handicrafts and souvenirs on display. To experience the best of the town, it’s worth booking a homestay or taking a room in one of the teak hotels overlooking the river; here you can enjoy a sundown drink while looking over into Lao PDR. and simply revel in the atmosphere of yesteryear. Wat Neramit Wipatsana: It’s common for visitors to Thailand to restrict their temple viewing to Bangkok’s historic wats presuming anything more modern won’t live up to their beauty. But Loei’s Wat Neramit Wipatsana shows that newer temples can still astound you while drawing on ancient inspiration. This temple outside Dan Sai is made of laterite bricks that make it feel much older than it is. 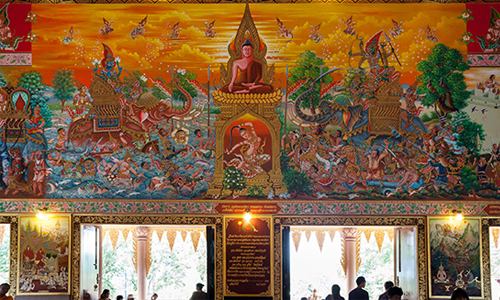 There are some gorgeous murals showing the life of the Buddha and window shutters decorated with creatures from the mythical forests of Himmapan. The temple’s setting in the green hills of Loei deliberately evokes Southeast Asia’s tradition of forest mediation. The gardens are stunning with trees, statues and walks, and you can spend a peaceful afternoon here simply looking around. 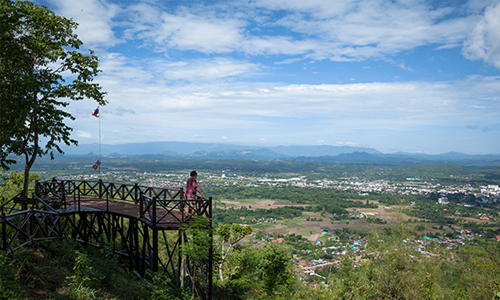 Lookout over Loei from Phu Bophit: The stairs that take you up the 255 forested metres of Phu Bophit curve around the limestone hill like a scene from a Chinese painting. But unless you’re in good shape, you won’t initially appreciate the serenity it’s a tiring climb. But don’t let the hike put you off. You can take breaks on route and explore caves and Buddhist images. At the top, once you’ve caught your breath, you’ll lose it again taking in the view. The town of Loei and the ocean of green hills stretch out for miles in every direction. You can see all of the province’s landmarks; such as, Phu Kradueng and the distinctive Fuji shape of Phu Ho, and this is one of Loei’s best places to enjoy the rising and setting of the sun. Getting there: Plane: Nok Air and Air Asia make daily flights from Bangkok to Loei Airport. Train: Loei is not serviced by rail, but you can take a train to Udon Thani (150 km east) and continue the journey by local bus. Bus: Buses leave Bangkok’s Northern Bus Terminal (Mochit 2) to Loei every day between 8.30 a.m. and 10.00 p.m.
Best time to visit Loei is pleasant at any time of year, but the most popular time to hike tends to be mid-October to February when temperatures drop.